I was so bitterly disappointed in the outcome of the metallic paint top DIY that I did a month ago. You may recall it in – this – post. Basically the metallic fabric paint didn’t withstand a cool, gentle wash. About 60% of the paint washed out. I followed the instructions and made sure I ironed it after it was fully dry so I don’t know what went wrong. Worse than that, the other items in the wash all got covered in fine particles of glitter paint, including my husbands T-Shirts. Not a look he was hoping for. 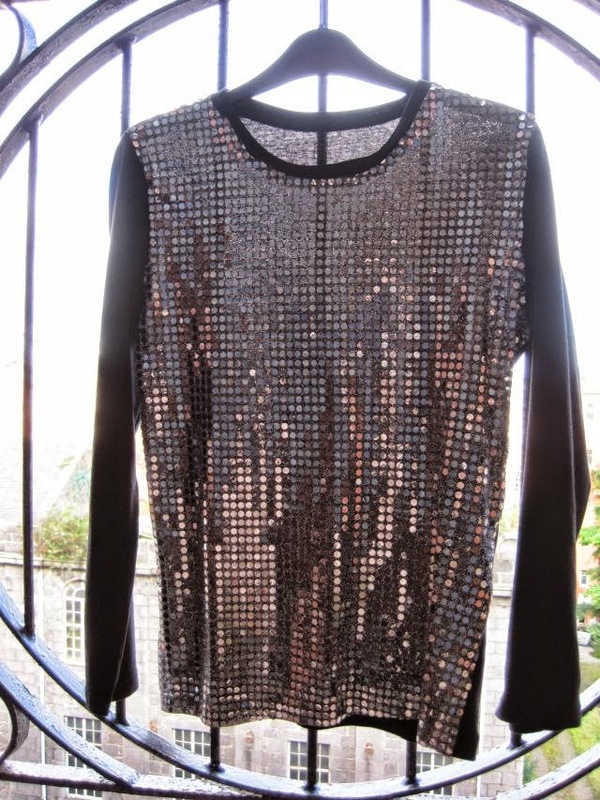 I was determined to have a metallic top so I came up with Plan B. I bought a piece of sequin mesh fabric and used it to cover the horribly faded metallic paint on the front on my T-Shirt. And actually it looks far nicer. I wish I had tried this first but that’s how you learn. Here’s how I made this T-Shirt. Lie the T-Shirt flat on the floor. Using a ruler measure 3 centimetres in from the side, arm and neck seams and using soap or chalk mark where to cut. Start cutting at the bottom left up toward the arms leaving 3 centimetres of T-Shirt behind. Cut up the left side, around the arms, across the neckline and back down the other side. Make sure you leave those 3 centimetres behind as you need to have something to attach your new piece of fabric on to. The piece you have just cut from your T-Shirt is your pattern. 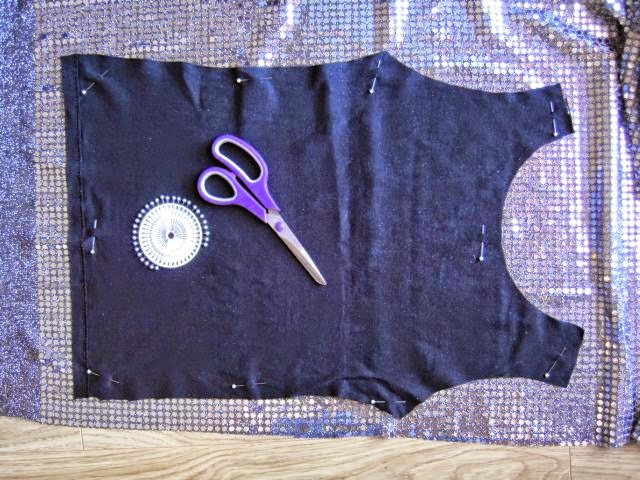 Pin the pattern piece you have cut from you T-Shirt onto your sequin mesh fabric. Cut the new piece of fabric allowing about 6 centimetres all around. Hem the new piece of fabric and them pin it to the front of your T-Shirt. Either hand sew or machine sew it in place and you’re done. I was worried about ironing the T-Shirt as the sequins are plasticky. But using a piece of muslin and with a medium hot iron the hems were fine. You can use just about any stretch fabric for your front insert. Think animal prints, Breton stripes or neon colours. For more DIY inspiration visit the Greenie Galleries at the top of the page. Don’t forget to ‘like’ Greenie if you found this post useful. The facebook link is at the top right of this page. Addendum. This sequin mesh does not launder well. See photo at right. I have to cut it out and re-do this DIY with another fabric that will hopefully hold up to laundering.